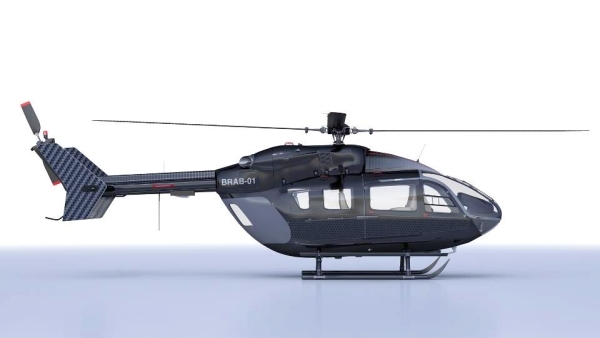 The BRABUS Private Aviation exterior liveries for Eurocopter’s ‘ultimate multirole helicopter’, the EC 145 continues the tradition of the BRABUS Private Aviation exterior livery designs for business aircraft like the Global Express XRS. Bridging the gap between our aircraft designs and our automotive designs, our designers have transferred the main features of the “BRABUS BLACK DIAMOND” Exterior Liver to the rotorcraft. 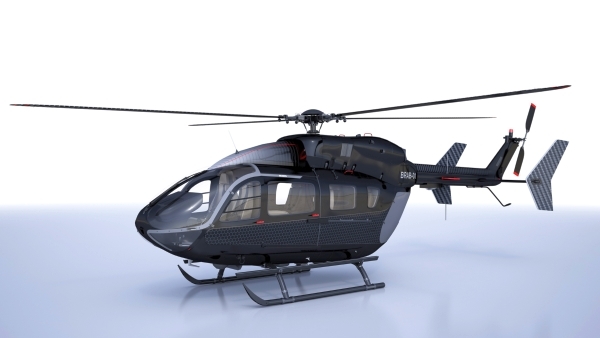 The Black Edition exterior livery, shown here for the Eurocopter EC 145 lends the helicopter a very modern appearance. Several paint features like the door handles and rotor tips colored in red, the honeycomb design structure on the side and specially painted, horizontally striped main rotor blades create an absolutely unique look that together with the black body of the aircraft represents the signature high-tech BRABUS style. The tail boom has a carbon fibre-look again pointing out the automotive history of the brand. Furthermore the elegant lighting spots, illuminating the ground next to the landing skids are yet another feature transferred from BRABUS supercars to the EC 145 exterior design.